The Direct Fusion Drive (DFD) concept provides game-changing propulsion and power capabilities that would revolutionize interplanetary travel. 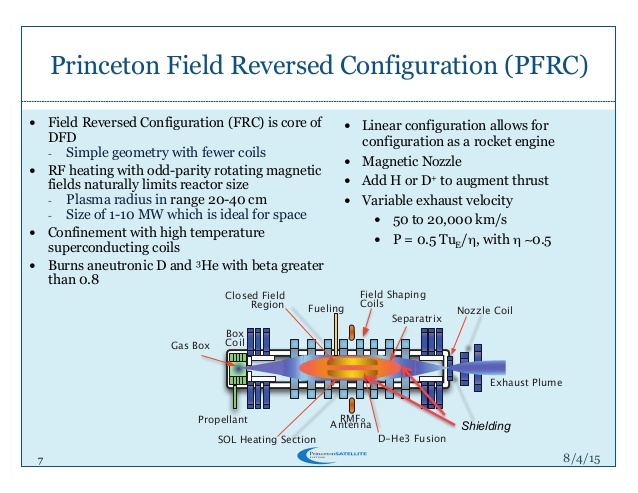 DFD is based on the Princeton Field-Reversed Configuration (PFRC) fusion reactor under development at the Princeton Plasma Physics Laboratory. The mission context we are proposing is delivery of a Pluto orbiter with a lander. DFD provides high thrust to allow for reasonable transit times to Pluto while delivering substantial mass to orbit: 1000 kg delivered in 4 years. Since DFD provides power as well as propulsion in one integrated device, it will also provide as much as 1 MW of power to the payloads upon arrival. This enables high-bandwidth communication, powering of the lander from orbit, and radically expanded options for instrument design. The data acquired by New Horizons’ recent Pluto flyby is just a tiny fraction of the scientific data that could be generated from an orbiter and lander. Engine modeling accomplished during Phase I has shown that we can expect 2.5 to 5 N of thrust per megawatt of fusion power, with an Isp of about 10,000 seconds and 200 kW available as electrical power. We have evaluated the components of the Pluto trajectory including an Earth departure spiral, constant thrust planar transfer, and Pluto insertion using these thrust and Isp levels, and confirmed the plausibility of the proposed mission. In fact, the mission can depart from LEO with about the mass we originally estimated for an interplanetary insertion, widening the range of available launch vehicles and reducing the cost. 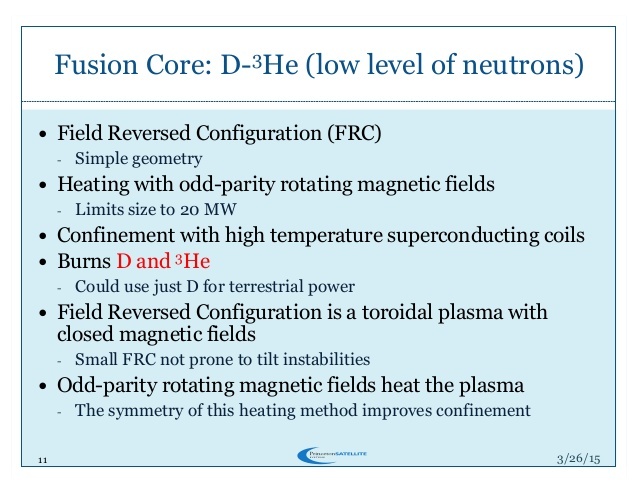 The key objective of the Phase II proposal is to further advance the design and TRL of selected subsystems, such as the superconducting coils, RF heating, and shielding. 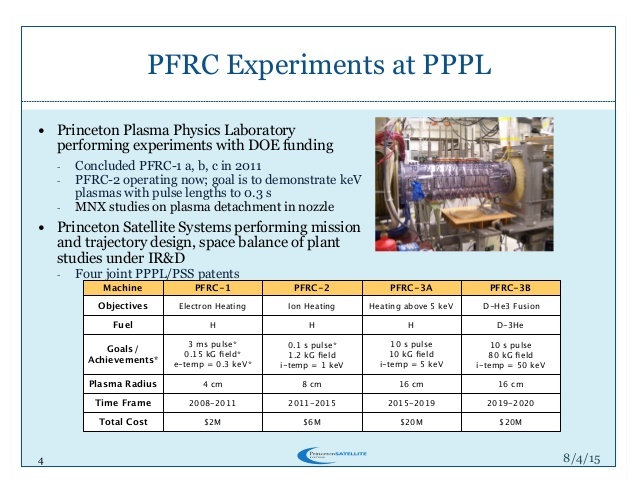 PPPL will perform experimental work on the existing PFRC-2 testbed using a gas puff valve, to further investigate the dynamics of the thrust augmentation system (additional gaw flowing through the FRC scrape-offlayer). We will explore the design of a no-thrust mode that captures and reuses the propellant, possibly extracting more power while in orbit around Pluto. Finally, we will develop a model of the synchrotron radiation that is specific to the FRC configuration, as available models are derived from tokamaks. Direct Fusion Drive is a unique fusion engine concept with a physically feasible approach that would dramatically increase the capability of outer planet missions. The fusion-enabled Pluto mission proposed here is credible, exciting, and the benefits to this and all outer planet missions are difficult to overstate. The truly game-changing levels of thrust and power in a modestly sized package could integrate with our current launch infrastructure while radically expanding the science capability of these missions. The Direct Fusion Drive (DFD) concept provides game-changing propulsion and power capabilities that would revolutionize interplanetary travel. DFD is based on the Princeton Field-Reversed Configuration (PFRC) fusion reactor under development at the Princeton Plasma Physics Laboratory. The mission context we are proposing is delivery of a Pluto orbiter with a lander. The key objective of the proposal is to determine the feasibility of the proposed Pluto spacecraft using improved engine models. DFD provides high thrust to allow for reasonable transit times to Pluto while delivering substantial mass to orbit: 1000 kg delivered in 4 to 6 years. Since DFD provides power as well as propulsion in one integrated device, it will also provide as much as 2 MW of power to the payloads upon arrival. This enables high-bandwidth communication, powering of the lander from orbit, and radically expanded options for instrument design. The data acquired by New Horizons’ recent Pluto flyby is just a tiny fraction of the scientific data that could be generated from an orbiter and lander. We have evaluated the Pluto mission concept using the Lambert algorithm for maneuvers with rough estimates of the engine thrust and power. The acceleration times are sufficiently short for the Lambert approximation, i.e. impulsive burns, to have some validity. We have used fusion scaling laws to estimate the total mission mass and show that it would fit within the envelope of a Delta IV Heavy launch vehicle. Estimates of the amount of Helium 3 required to fuel the reactor are within available terrestrial stores. In this Phase I study, we propose to analyze the Pluto mission concept using new models of the engine. We will develop an optimal trajectory including limits on the thrust steering and range of throttle. The throttling of the thrust and specific impulse will affect the efficiency, which we have not yet attempted to model. 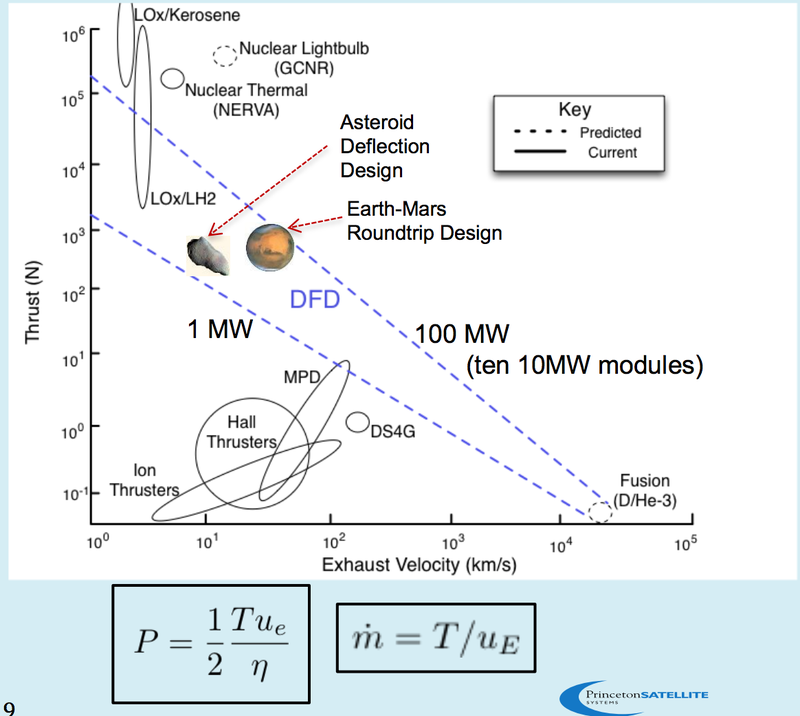 • The DFD design envelope fits between traditional chemical, electric and nuclear propulsion methods. • We can convert some of their kinetic energy into thrust by transferring energy from the fusion products. This is different than the John Slough’s direct fusion drive rocket design. John Slough also had NASA funding.